Imam Kabbar's work extends beyond the Muslim community as he always carries a modern universal approach in his message in all of his speeches. He is actively involved in the Muslim and non-Muslim community and teaches courses about Islam. He delivers many speeches to various community groups including Universities, Secondary Schools, and other social occasions. He has been actively involved in da'wah through interfaith dialogues and has appeared on several newspapers and TV programs. 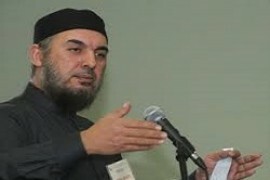 Imam Abdul Raouf Kabbar Sheikh Abdul-Raouf Kabbar was born in Lebanon 1967. During his youth, he spent his time as an Imam in Lebanon. In late 1997, he moved to Canada. He currently lives in Cambridge and is the Imam of the Islamic Centre of Cambridge. He is married and is blessed with two daughters. He has been working in the field of Da’awah for the last 20 years between Lebanon and Canada. Prior to this he was a member of the Islamic International Relief Organization (IIRO) and was serving as an Imam in Lebanon. Imam Kabbar, have also been serving the Canadian Muslim community since 1997 as an Imam, lecturer, teacher and chaplain. He provides religious guidance and counseling. He is also a member of the Canadian Council of Imams. Sheikh Kabbar has a clear understanding of Islam and comprehensive knowledge of the Qura’an and Sunnah. He is an exceptional speaker and motivator about Islam.